From Europe to Antartica to stranded islands, Biohazard: Revival Selection brings gamers across the globe to deal with the zombie outbreak. 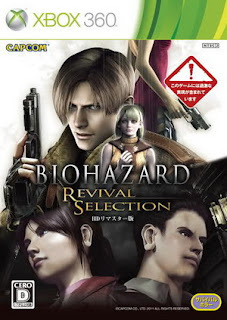 The Blu-ray disc contains two hit games in the series: Code Veronica and Biohazard 4. Code Veronica takes place 3 months after tragic events in Raccoon City. Clair heads off to the Umbrella Corporation Head Quarters to find her missing brother. Biohazard 4 takes place 6 years later, where Leon is sent on a mission to locate the president's daughter. The graphics are all remastered to HD quality. The zombies become more hideous with all their blood thirst magnified.